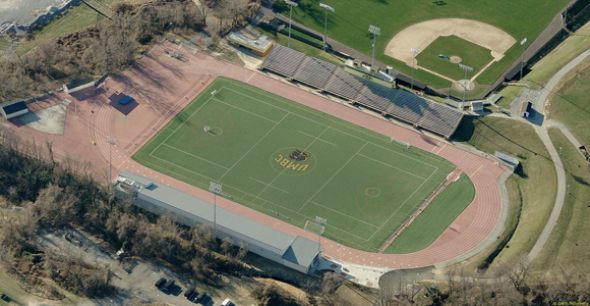 The UMBC Stadium was built in 1976 with a seating capacity of 4,000. Lights were added in 1992, and in 1996 a world-class track and field complex was added, which included jumping and throwing areas. The Jim Pfrogner Press Box, which is named for UMBC’s long-time cross county and track and field coach, was refurbished in 2000 and features two rooftop broadcast booths and wireless internet capabilities. In the spring of 2005, UMBC Stadium’s original Deso- Turf surface was replaced with Sportexe’s Momentum 51 synthetic turf at a cost of over $800,000. Momentum 51 synthetic turf is an infill system, consisting of 70 percent ground rubber and 30 percent kiln-dried sand. Other facilities which have utilized this product include M&T Bank Stadium (Baltimore, Md. ), N.M. Roberts Stadium (University of Southern Mississippi football), and Memorial Stadium (University of California-Berkeley). The newest renovations for the UMBC Stadium are currently underway and will provide a new $5 million locker room complex, which is expected to be completed in the spring of 2008 and will house all of UMBC’s outdoor teams. The complex will feature eight locker rooms for home and visiting teams, as well as a new sports medicine facility, a laundry room, a meeting room that will be available to the media, and a coaches and officials locker room.